APEXA is the Canadian digital life insurance industry platform which provides smart contracting and compliance. Our third post in our Faces of APEXA series will give you the inside scoop on three of our newest team members: Mariah Clarkin, Sales & Communications Specialist, Rania Tanbouly, Bilingual Client Implementation Lead, and Megan Lussier, Client Implementation Lead. The sales landscape has changed drastically in the last ten years. A major contributor to these changes has been the increasing importance of social media as a selling tool. Prior to the emergence of social media platforms like Facebook, Instagram, LinkedIn, and Twitter, sales were made mainly via word-of-mouth, phone calls, company websites, infomercials, and advertisements in the newspaper. Of course, these sales channels still exist and matter, but social media has become a communication juggernaut that can no longer be ignored as an invaluable sales tool. #APEXANation, welcome to our APEXA 101 video series! This will be a four-part series covering the basic but important how-tos of using the APEXA system. 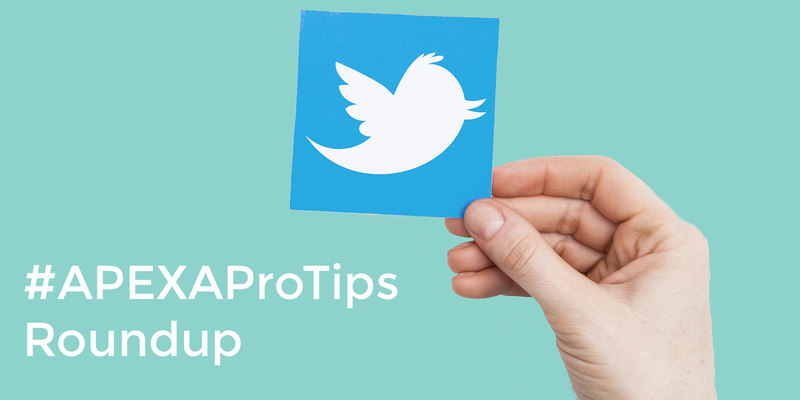 Welcome to the #APEXAProTips Roundup! #APEXAProTips are monthly live tweet sessions where the APEXA team stands by live on Twitter to answer all of your questions. The Roundup highlights the top questions. The following questions are from our second session on September 14th. Missed our first session? Make sure to check out our first Roundup here! [Video Series] APEXA 101: Welcome to APEXA! #APEXAProTips are monthly live tweet sessions where the APEXA team stands by live on Twitter to answer all of your questions. The Roundup highlights the top questions. The following questions are from the first session on August 18th.